Just a brief post to say that we found two Pileated Woodpeckers drilling on a tree not too far from the edge of a field. One flew off shortly after we stopped to watch them. The other continued working on another hole–to what is likely to be their nest. Pileateds often have two or more exits to their nests. I moved to a second location for a shot of the hole that the bird in the first photo had been working on. These are new holes going deep into the tree so it is clear they are not just feeding. Pileateds nest only one season in the same nest. After that, other residents move in. I’ll have regular reports as I visit this location on a weekly basis, perhaps even some video of the future fledglings. Stay tuned! We went on an automobile caravan field trip with fellow members of the Rochester Birding Association in mid-January (each with a hand-held two-way radio). 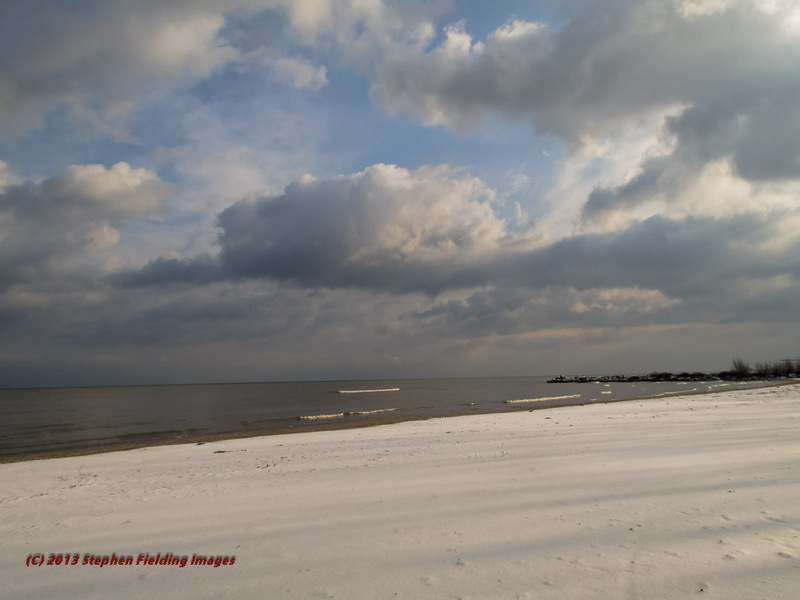 It was one of those winter overcast days so common here on the Great Lakes. These trips are always a bit frustrating for us bird photographers because the true birders are happy to spot with binoculars and high-power spotting scopes. In contrast, I’m limited to my 100-400mm auto-focus lens, which extends to 560mm with the 1.4X tele-converter (without auto-focusing). The result is I get far fewer bird opportunities. As we drove down a farm road someone spotted a flock of birds high in the trees so we all pulled over. 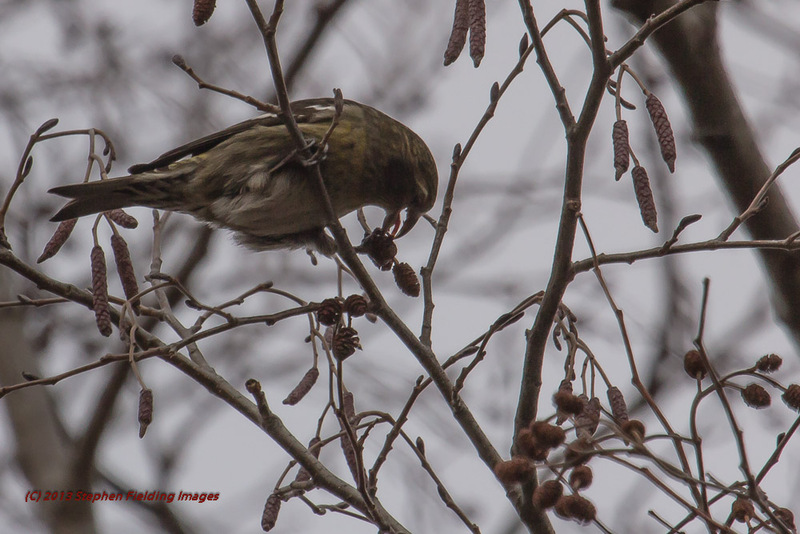 Shortly afterwards one person announced that it was a group of Red Crossbills feeding, with a few Pine Siskins mingling among them. Female Crossbills have no red, instead consisting mostly of olive-green. Found mostly across southern Canada Red Crossbills fan out to the Northwest Territories and into Alaska. They wander irregularly, depending on the availability of cone crops. What we saw was an irruption into the northern U.S.; sometimes they fly to the deep south. Their population has been stable over the past several decades. Since cloudy skies reflect more light than blue-skies I over-exposed by +2/3 to minimize silhouetting. The settings for the shot below are: 1/500 sec. @ f / 11, ISO 500. I’m way behind on my image processing and blog posts. I guess this is okay since most photography articles tell us to spend most of our time getting the shots and as little time as possible in front of the computer. 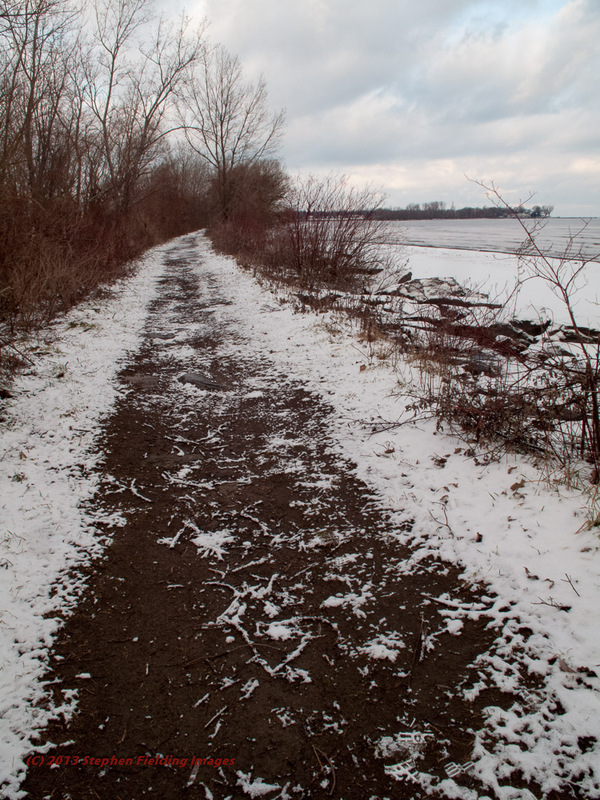 We visited High Acres for the first time in early November, located in Penfield, NY. 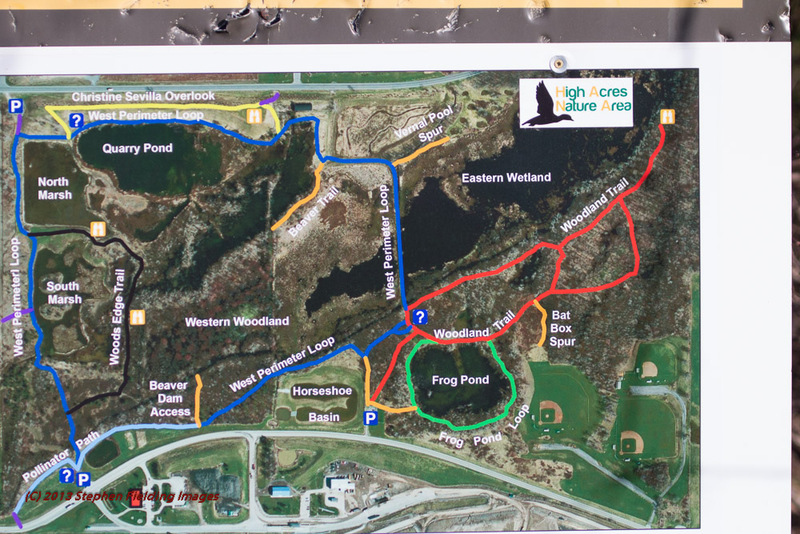 Surrounded by suburban development, it is nice to see the towns setting aside and maintaining nature areas. It was a nice fall day, though it was a bit chilly at 35º (but nothing like the 10º that we are currently experiencing during the day). We saw several hawks above, along with the usual crows. 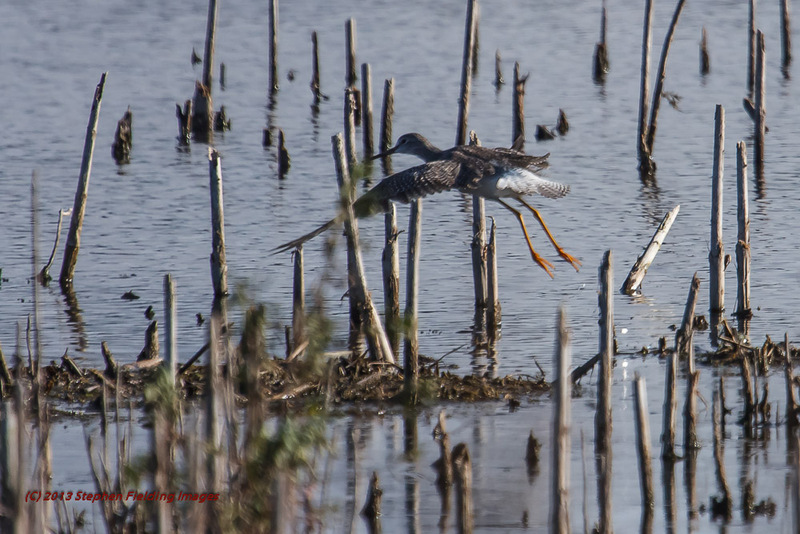 On the ground we saw Greater Yellowlegs and Great Blue Herons. As you can see in the photograph, above, there are several trails, most of which we hiked over a period of about 2 1/2 hours. 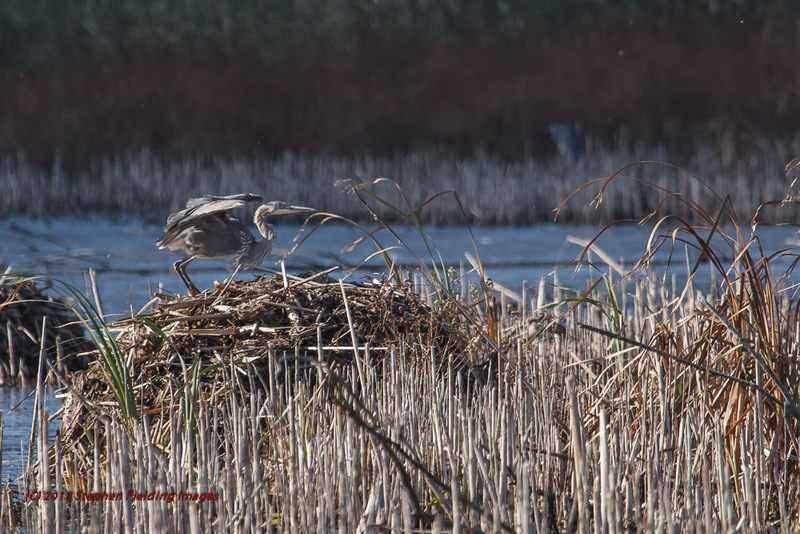 Most of the herons we saw on the ground were standing (you know, doing their mime acts) atop muskrat houses. 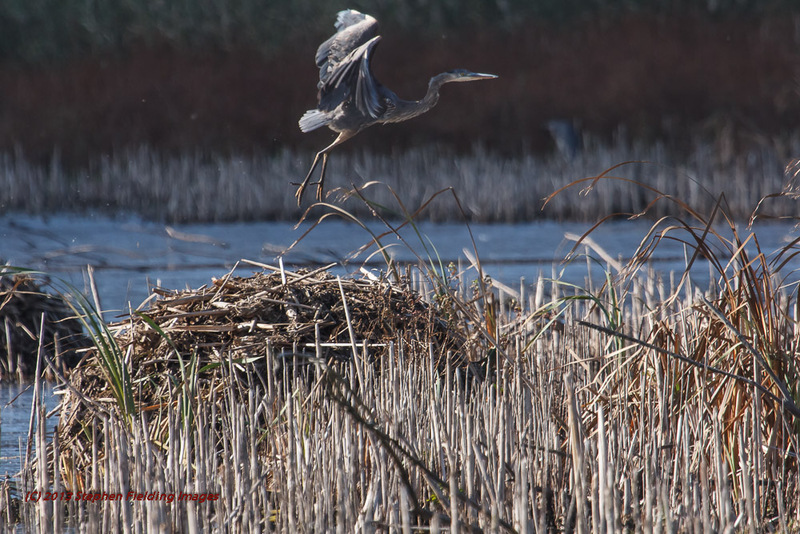 Since I have countless shots of Great Blue Herons I decided to see if I could shoot a launch sequence. 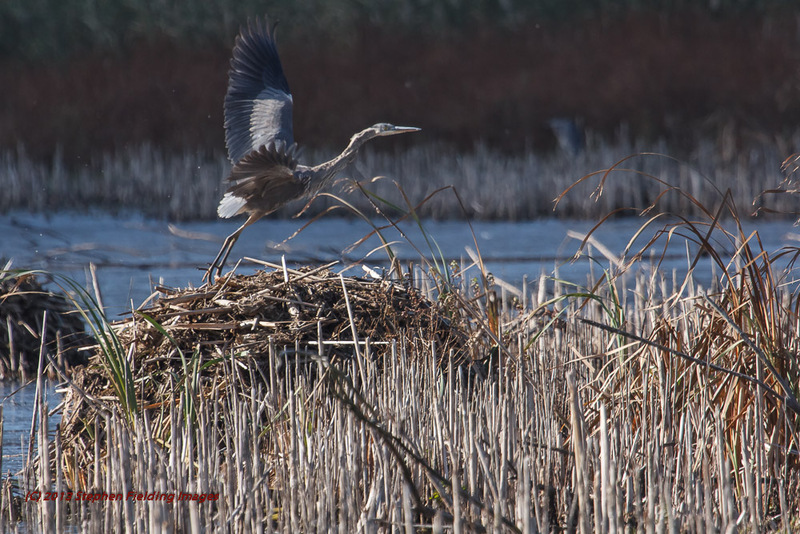 On the one hand, Great Blues are easier to catch taking off than songbirds because herons are so much slower. On the other hand, who knows when they will go? So I got the idea that if I set up my camera at the end of the levy bordering the pond where the heron was located and had my wife then cross it, that would cause him to vacate, much as was the case earlier with the other herons in the area. Well, wouldn’t you know, she crossed and it just stood there. She returned, he continued to stand still. My wife even waved her arms–to no avail. 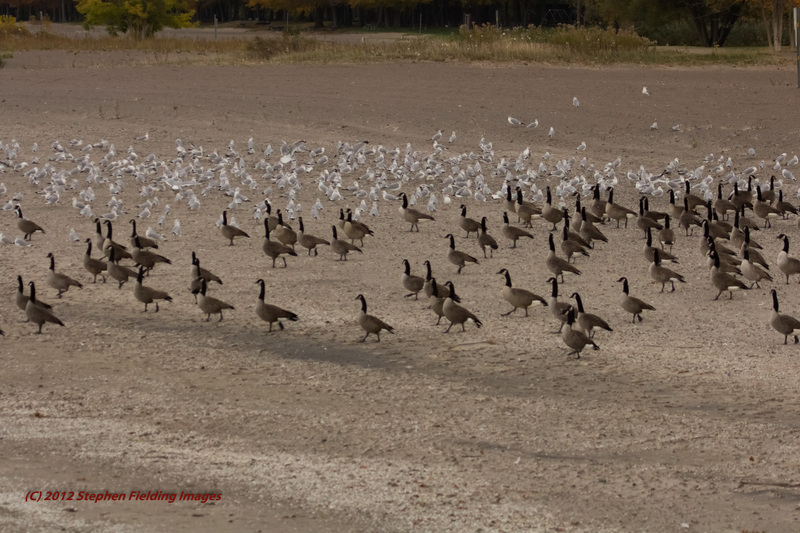 Clearly, this was an avian plot to thwart the photographer. I ended up standing behind my tripod for about half an hour. Then, he crouched–okay this is it! The heron has departed! I pressed and held the shutter button, and the proofs of my success are below. Shortly afterwards, it left to join a couple of its associates further out, but I managed to capture its lift-off. One of the features I’ve yet to take advantage of on my Canon 100mm-400mm L lens is the image stabilization setting for panning shots. The problem is that when panning shots on the wing occur, there is little time to reset image stabilization from stills to pan. Perhaps you have developed a strategy for switching IS modes? If so, please let me know. 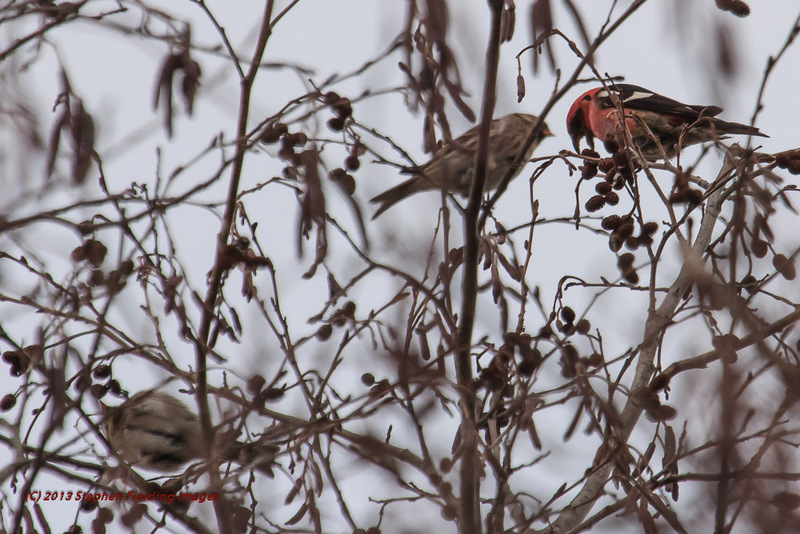 My next post will feature the return of the Red Crossbills. I have been busy re-tagging all my images since it turned out that Cornell’s All About Birds site was not up-to-date on its populations trends. I realized this when I began noticing differences in their information compared with Partners in Flight. Cornell told me to rely on Partners in Flight and that they would have their site updated in January. You may have noticed also that I updated my earlier Winners page in accord with my updated tags. Birds whose populations are declining include: American Kestrel, Baltimore Oriole, Barn Swallow, Blue Jay, Brown Thrasher, Brown-headed Cowbird, European Starlings, House Sparrow, Indigo Bunting, Little Blue Heron, Long-tailed Duck, Mallard, Northern Flicker, Northern Harrier, Northern Mockingbird, Northern Shoveler, Oak Titmouse, Red-winged Blackbird, Short-eared Owl, Song Sparrow, Western Meadowlark, and Wood Stork. 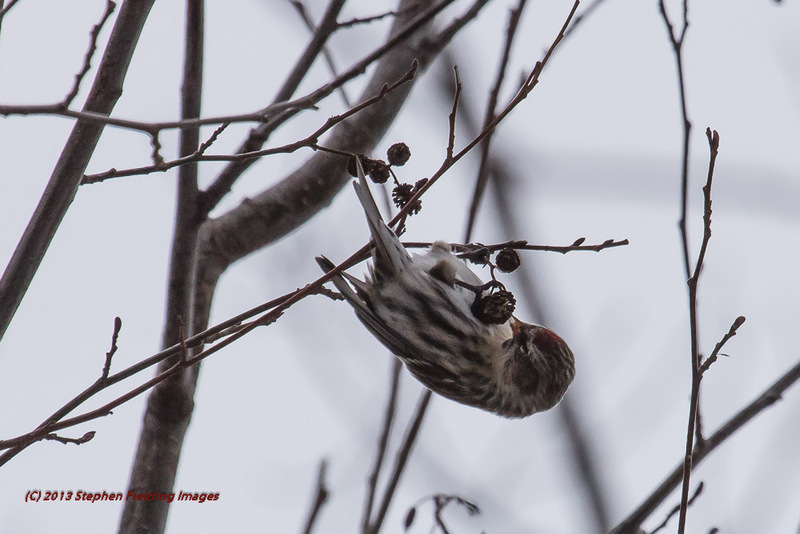 Species whose populations are uncertain are: Downy Woodpecker, Green Heron, and White-throated Sparrow. Declining and uncertain populations are not necessarily a sign that the species is threatened with extinction, since several of these species have very large populations to begin with. Nevertheless, they bear watching. This is an interesting bird because it feeds on other song birds, among other things. Although it has no talons, it has a hooked beak that it uses to kill insects, lizards, mice, and birds. It then impales them on thorns to hold them while it rips them apart. 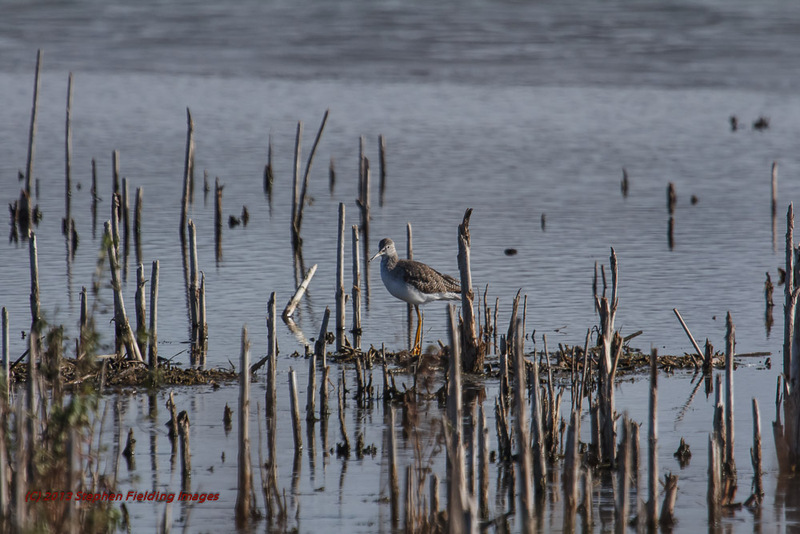 We found this bird along the open marshes frequented by Sandhill Cranes and other water birds near Lodi, California. 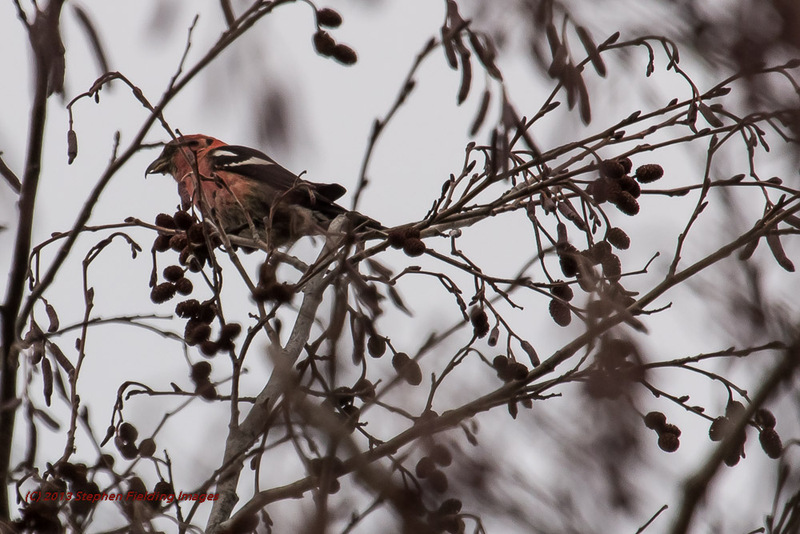 It has a wonderful song; it repeatedly swoops down from high trees or wires, then back up to is perch. This bird is in decline. The American River runs along side of the Effie Yeaw Nature Center where we saw Gulls (Increasing), Turkey Vultures (Increasing), a female Merganser (Increasing), a Ruby-crowned Kinglet (Stable), and a Western Scrub-Jay (Increasing). The first photograph shows an island where water birds tend to congregate and feed. 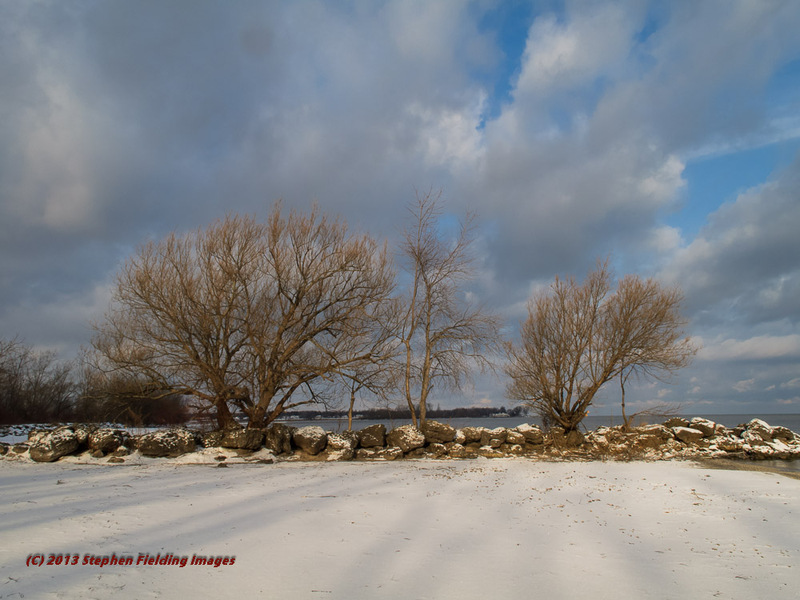 If you imagine walking along the shore to the right, we positioned ourselves to the right side of this island, where I took the second photograph. Here, Turkey Vultures had acquired a dead salmon for lunch, eagerly sought by another fellow scavenger–the Gull. Unfortunately for him, he was out-numbered and held at bay from this delicacy. Speaking of salmon, there were numerous dead salmon in the river–apparently expired after spawning. We decided to drop in to the “Dead Salmon Society” to see what was going on, as shown in the third photograph–not much. I was able to photograph a Common Merganser cruising along the shoreline by the feeding vultures. This is one of the diving ducks. As she swam, she would occasionally submerge her head to locate her prey, then dive to catch it. Among the numerous land birds we saw, I was able to photograph the Ruby-crowned Kinglet. They feed on insects as well as seeds and fruit by quickly moving through bushes and trees, much as do warblers. Fortunately, I was able to capture a few good shots, one shown in the next photograph. the binoculars, I had no such luck with the camera. As with Red-Wing Blackbirds, these birds have control over when to display their red feathers. Finally, last year I could not get an unobstructed view of a Western Scrub-Jay. This year, however, I was able to get several. Here, one is shown holding an acorn in his bill. When all was said and done, we had a pretty successful outing. On a recent trip back to California we went to the Effie Yeaw Nature Center http://www.sacnaturecenter.net–home of the Acorn Woodpecker. It lies north of Sacramento along the American River. My wife and I were there last year and it was so wonderful we just had to return. This year I was determined to get shots of these woodpeckers on the fly–no easy task since they are small and fly quickly. Another year’s worth of experience taught me that I should pick an “active” tree and set up my tripod at the best spot. I used my Canon 100mm-400mm lens with Canon’s 1.4X III tele-converter, giving me a focal length of 560mm. Since there was bright sun I was able to use shutter speeds of 1/2000 +. These birds gather acorns and stuff them into rows of holes that they drilled into trees. The acorns in the California Oaks are slender, compared with their round counterparts in the East. These birds fly among live and dead trees in relatively open areas, as shown in the first photograph. telephoto lens. If you would like to see larger images they can be found in my on-line gallery. Do let me know if you have had any experience photographing these birds and how you might have captured them in flight. 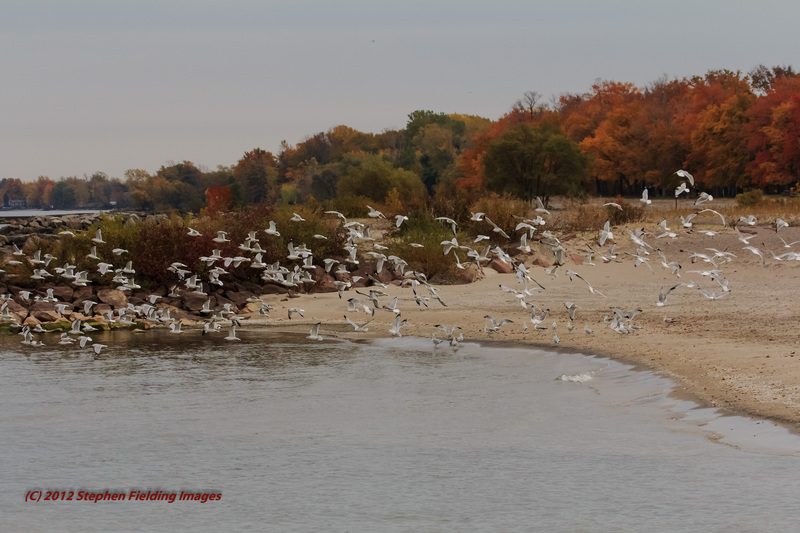 Occasionally, the Gulls would take to the air, circle, then land at the same spot. 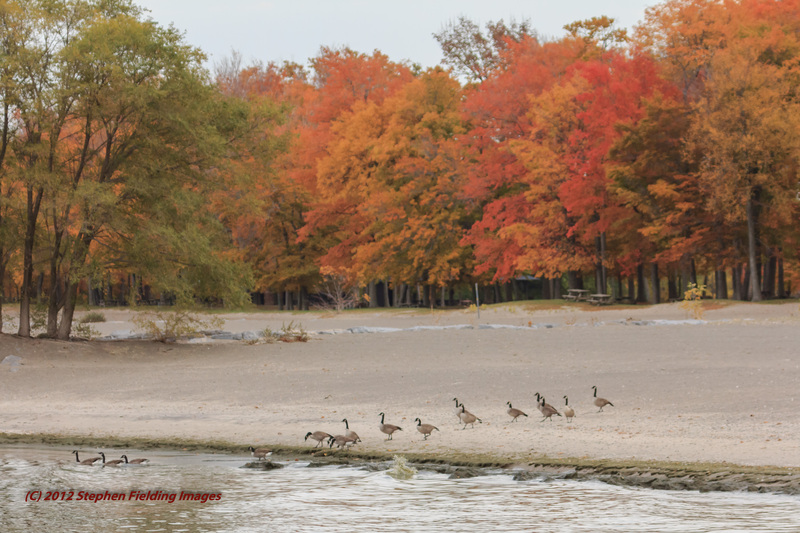 Geese are highly structured in their ways–here, following the leader into the water. 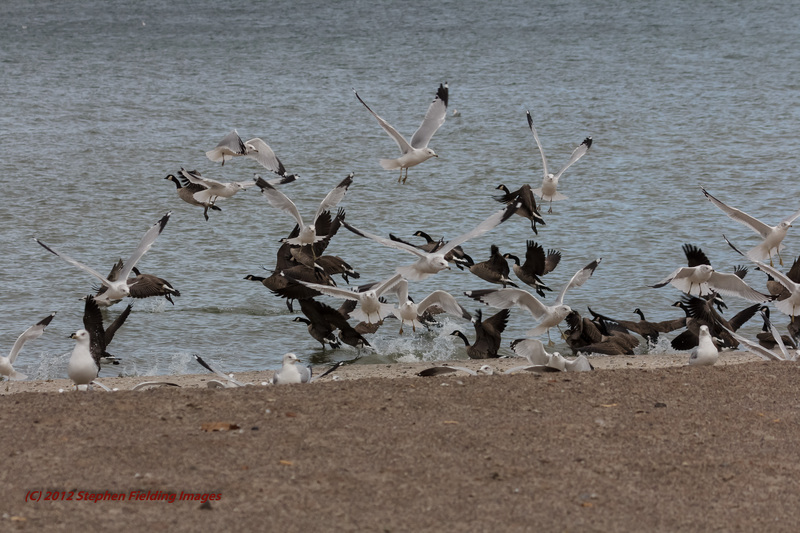 Sometimes people on the beach got too close for comfort, causing the birds to launch, only to return a few moments later. 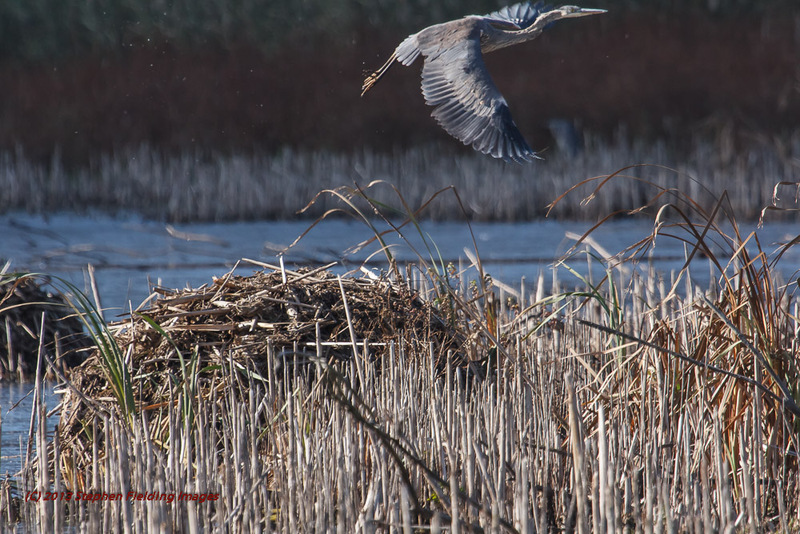 Interestingly, the Cornell Lab of Ornithology just announced that Superstorm Sandy has blown a number of migratory water birds, not normally found here, our way. We plan to return to the beach this week-end to see what might be around. 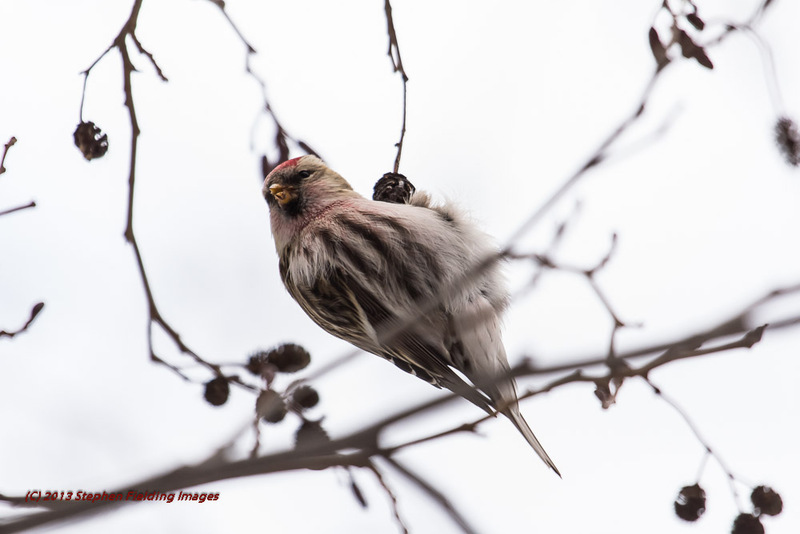 What unusual bird sightings have you observed in the wake of Superstorm Sandy? I’m way behind on my posts; this is partly due to my being out shooting in the field. I plan to post more soon! 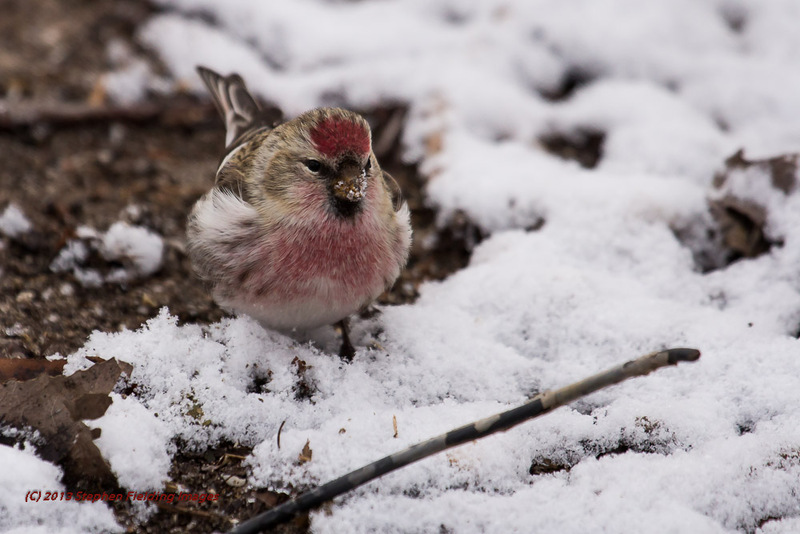 Some of these posts will discuss bird populations. My “How the Bird Photos Were Collected” page highlights not only how I collected my bird photos, but also my rationale for providing the population trend of each bird during the past 30 years or so. I’m in the process of sorting the bird photos by whether their populations are increasing, decreasing, or remaining stable to see what common characteristics each category might have.